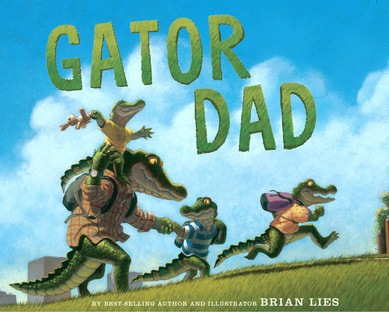 Award-winning author and illustrator Brian Lies’s latest effort, Gator Dad, is a picture book inspired by his experiences as a stay-at-home dad. After the birth of their daughter, Lies supported his wife’s decision to go back to work full time after completing maternity leave. He already worked from home, and life as a stay-at-home dad felt like the natural choice for his family. Beautifully illustrated and fun-filled, Gator Dad tells the story of a stay-at-home dad with three young children as they set out to “squeeze the day.” At first I was bothered by the mixed metaphor—boa constrictors squeeze and gators chomp, right? However, the cliche won me over in the end, with its zest for life and love for family. Gator Dad takes his children on normal errands, like going to the grocery store, but he’s not interested in a hum-drum ordinary day. When Gator Dad runs errands, he literally runs, speeding through aisles until the cart— filled with groceries and his three little gators— flies off the floor. The little gators are delighted. They go to the park and jump in the river, because Gator Dad likes to have fun, too. In many ways, Gator Dad reminded me of the picture books of my childhood. But unlike the ducklings who journey to the park in Make Way for Ducklings or the anthropomorphized family of bears in The Berenstain Bears, even the friendliest cartoon alligator can be a little bit scary. A mouth full of laughing gator teeth can seem sinister (anybody remember that crocodile in Peter Pan? ), but with Lies’s skillful illustration, these gators are simply fun-loving rascals. Those mischievous smiles are paired with bright, loving eyes, and the settings are rich in detail and depth. My favorite illustration shows the family walking over the pond on a fallen log. The youngest rides on his father’s back, and in the background, a hare sits on the shoreline, dangling his feet in the water as he fishes. The language is— for the most part— secondary to the illustrations in Gator Dad, but there are a few lines from Lies that are striking and lovely. “I’ll be your raft on a sea of grass,” the Gator Dad tells his children, “a tree for you to climb.” Gator Dad is a full-time father who loves being with his children, and that warmth comes across on the page. Lies set out to write a book about the special relationship between fathers and their children, and to show the great fun a stay-at-home dad can have with his kids. I think Lies has done just that, and this book would make a great addition to a child’s bedtime routine. I’ll follow Gator Dad’s lead and assert that there’s always time for one more story. Jaimie Eubanks lives, works and writes in Minneapolis and Miami. She is currently pursuing an MFA at Florida International University. Her work can be found in places such as Buried Letter Press, Literary Orphans, Thought Catalog, and Word Riot. To read more of Jaimie’s writing visit www.jaimieeubanks.com. In the opening sentence of Edwina Raffa and Annelle Rigsby’s 115 page children’s novel, Kidnapped in Key West, twelve-year-old Eddie Malone is being reprimanded by his pa, Frank, for skipping school. “You’re in trouble, boy!” he says. And Eddie’s troubles have just begun. It is 1912. Frank is a track layer for tycoon Henry Flagler’s eighth wonder of the world: the 128 mile extension of Flagler’s Florida East Coast Railway from Miami to the Keys. Frank is working on the final third of the line reaching from Marathon, over the seven mile bridge, to Key West. Knowing his pa is upset about being called into school and missing a half-day of employment, Eddie stays out after dark to avoid his wrath. Pa eventually catches up to him, but fortunately for Eddie, Pa’s anger has been replaced by a concern for his whereabouts. Walking back to their tent they spot a robbery going on in the railroad’s paymaster office. Eddie’s pa is accused of the crime and thrown in jail. Raffa and Rigsby, former elementary school teachers who have written two other children’s books together, spin this historical thriller into motion. Eddie and his yellow Labrador, Rex, are left to find the real culprits and prove Pa’s innocence. Their journey takes them from Marathon to the iconic landmarks of Key West such as Duval Street and the Key West Lighthouse, and to Fort Jefferson in the Dry Tortugas. “Come on Rex,” said Eddie. “Let’s go see what’s in those buildings on the docks.”… Eddie saw a man with a clipboard supervising a construction job… “Excuse me sir. What’s going on here?" “We’re working on Mr. Flagler’s train terminal here on Trumbo Island." The man made a dramatic sweep of his arm. “Mr. Joseph Parrott had thousands of cubic feet of mud and marl pumped from the bottom of the Gulf to make this ground. We Conchs figured he was digging up half the bay, but I guess he had to do it. Land here in Key West is pretty scarce." When Eddie is about to be tossed in an abandoned Fort Jefferson jail cell, we get information from a talkative bad guy regarding the prison’s most famous inhabitant, Dr. Samuel Mudd. “Why, Dr. Mudd set John Wilkes Booth’s leg after Booth shot President Lincoln in the Ford Theater. You see, Booth broke his leg jumpin’ down onto the stage to get away." “Aren’t doctors supposed to help people?” asked Eddie, keeping the conversation going. “Well, yeah,” answered Leo, “but Booth killed the president!… He finally got pardoned though… When a yellow fever epidemic broke out in prison, Dr. Mudd saved a lot of lives. Because of that, the President done gave him a pardon and set him free…and you ain’t sure gettin’ one of those." The authors aren’t afraid to make their protagonist suffer. Eddie is beaten—not too explicitly—enslaved, thrown overboard into the ocean, covered with coal, and even loses his best friend, Rex. In a structure reminiscent of the old cliff hangers, nearly every chapter ends with a page turner: ominous knocks on the door, entrapment, and death threatening set-ups. Though the book is geared toward nine-to-twelve-year-olds, others will enjoy it, too. Kidnapped in Key West, like Flagler’s Over-Sea Railroad, is a suspenseful ride through an important period in Florida’s southern-most region. Raffa and Rigsby nail their story like a well-placed rail spike to a crosstie. Louis K. Lowy, a former firefighter, is the recipient of a Florida Individual Artist Fellowship. His work has appeared in Coral Living Magazine, New Plains Review, Merge and Ethereal Tales, among others. His sci-fi novel Die Laughing is scheduled for release in April 2011. Contact him at his website www.louisklowy.com. This cute Christmas story geared towards kids four and up tells the story of Santa Claus trying to deliver presents to the children of Florida. 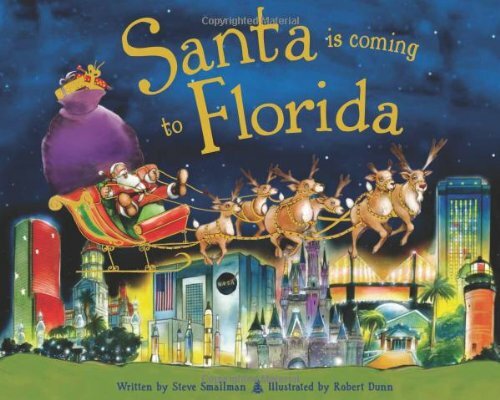 Steve Smallman’s Santa is Coming to Florida, with illustrations by Robert Dunn, is a colorful rendition of the familiar plotline of Santa, with the help of his elves and reindeer, getting ready to leave the North Pole for his annual voyage and the adventures he encounters en route as he tries to make his deliveries on time. What sets this story apart from countless others is its supposed focus on Florida, but both Smallman and Dunn fail to showcase Florida’s uniqueness. And elsewhere there are creative, fun arrangements of the words. For example, when describing the heavy bag of presents as “really, really big,” the font grows in size with every word, while the description of the elves, who are “really, really small,” shrinks in size. In a scene after a minor accident in the sky, the words are slanted in imitation of the gifts falling. Older children and parents may question the need for Santa’s Global Positioning System (GPS)—the Santa-nav—when he has managed to find his way around the world without a digital technology before now. This discrepancy will most likely not bother elementary school children, who will probably see the Santa-nav as a logical tool, having grown up in the digital age. The characters’ lack of names pose another problem: besides Santa, no one else is named. The other main character, “the youngest reindeer,” is not given a proper name as though it is unworthy of being named or the author could not think of one. There is even an “old reindeer with the red nose” who is suspiciously never given a name either, a parenthetical question appearing next to the text: “(Red nose … I wonder who that could be? )” A small child may get a thrill in guessing who the elderly red-nosed reindeer is, but it will make an adult consider the fact that Rudolph is copyrighted and wonder why the author didn’t fully invent new characters. The title and front cover imply the story will be about Florida and the many places Santa will visit in the state. Adults should be aware that Santa is Coming to Florida does not teach geography or portray the cities, monuments, national parks, and historical sites found in Florida. An exception is Miami’s Freedom Tower, but a small child will normally not know about the tower unless he or she has visited it or heard about it at home (and some may have heard it referred to in Spanish as la torre de la libertad). Miami’s Trinity Cathedral and around ten cities are mentioned with no accompanying drawings. The picturesque painting on the front cover, which misguides potential readers into thinking the story will be solely about Florida, is a smaller version of a two-page spread of a multitude of landmarks, none of which are named or explained in the text. And, in fact, the authors have a series of these books, in which Santa goes to Chicago, Boston, South Carolina, etc., obviously just switching out one location for another on the Santa-nav. Santa is Coming to Florida offers a children’s Christmas book with a few above-level words that may require adults to define them for younger readers. The pretty and colorful paintings will please children and adults alike. Adult scrutiny will reveal some flaws, none of which will likely be apparent to the book’s intended audience. Giselda Aguiar, a graduate student in the MFA Program in Creative Writing at Florida International University, is from Hialeah, FL. Greedy land speculation, skyrocketing property taxes, homes on the brink of foreclosure and wildlife on the brink of extinction—these headlines, which could be plucked from tonight’s evening news, set the stage for The Last Egret, a spirited 19th century adventure through South Florida’s homestead infancy and swampy wilderness. 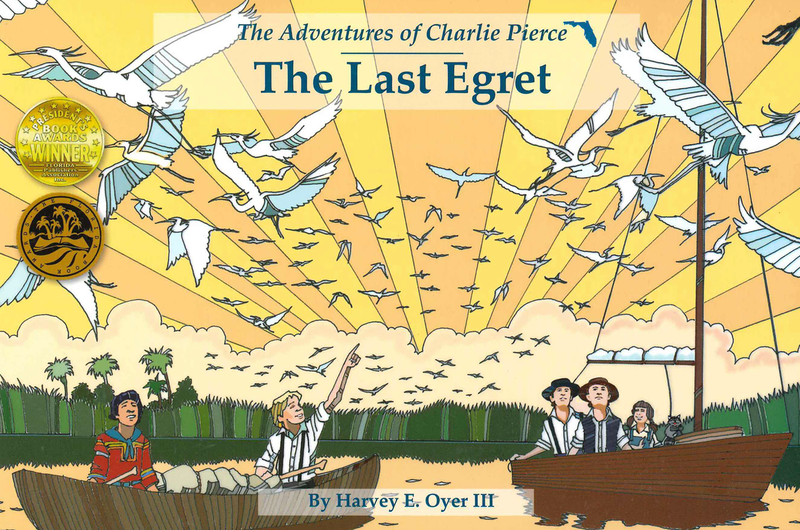 This is Harvey E. Oyer III’s second installment of The Adventures of Charlie Pierce, based on the real-life Pierce (1864-1939), Oyer’s great-granduncle, whose journal kept from early childhood on helped to provide the basis for Pierce’s important history, Pioneer Life in Southeast Florida. In The Last Egret, Charlie is a bold young teenager who lives with his mother, father and his scrappy little sister, Lillie, in a Florida frontier jungle that would eventually become Palm Beach. The Pierces live off the tropical land they love, until they become financially ensnared by rising property taxes and shifty land speculators, and Charlie’s father decides the only option is to sell the family home. One afternoon a plume hunter, John Samuelson, sails up to the Pierce dock, his skiff loaded down with crates of feathers. Samuelson tells the family how plumes of egrets, ospreys, herons and other native Florida birds are the latest fashion accessories for ladies’ hats, especially for women in New York. The rarest and most valued of all the plumes are those of the snowy egret, and Samuelson claims to have seen a rookery deep inside the Everglade swamplands just south of Miami. Once Samuelson departs, Charlie hatches a plan to save the family home by cashing in on the booming plume trade. He enlists the help of Tiger Bowlegs, his Seminole best friend, and Guy and Louis Bradley, two teenage brothers. Together the boys form an expedition team in search of the rookery and the fortune its birds could provide. The boys—and Lillie, who stows away—are confronted by a pair of golden panthers, a hungry shark, and a venomous water snake as the expedition winds its way through the swamp. At the Brickell trading post on the Miami River, they meet Mary Brickell who tells them, “. . . prices were still going up. Swallows and sea tern skins were fetching twenty-five cents apiece. Pelicans were worth fifty cents. A great white heron skin could get ten dollars and flamingoes and snowy white egrets were worth an unbelievable twenty-five dollars." The value of the feathers drives them on despite dangers, and the search for the rookery draws the boys deeper into the swamp—and eventually into the moral predicament of plume hunting. Although The Last Egret is a children’s book, the story relies a bit too heavily on facile stereotypes of noble Seminole natives pitted against the destructive and wasteful “white man.” I also found myself hoping the expedition would be stalked by a grisly and demented plume hunter or perhaps the egrets would go all Hitchcock on Charlie and his friends—meaning the "adventure" in The Last Egret is not adult-level thriller, but for kids the point is the experience of seeing Florida's wildness and learning the lesson that preserving the environment is an essential part of preserving one's heritage. When the group reaches heaping mounds of egret carcasses—plucked clean by plume hunters—they come face-to-face with the environmental toll of greed. The kill would certainly save Charlie's home, but is it a price he is willing to pay? Physically The Last Egret is a beautiful book—with many brilliantly crafted illustrations by James Balkovek that resemble wood etchings consistent with the late 1800s. The wide pages are a nice touch too, allowing parent and child to share easily in the reading experience. Oyer’s work provides a fine tribute to South Florida’s humble beginnings and a touching portrait of a forgotten wilderness. The Last Egret will teach children the importance of preserving not only the environment, but also one’s heritage. Sean Kenniff is the author of Être the Cow. Learn more about him and his work at etrethecow.com. Dogs are a favorite subject of elementary students. There are many books for that age level which describe the various breeds. However, the responsibility and realities of being a dog owner are often overlooked in these nonfiction books. Here's What I Know So Far, written by Jacksonville author Diane Till, provides a realistic first person (puppy) perspective of a dog's life from the moment of birth and being adopted by a little girl. Through poetry, humor and insight, the author pulls the reader inside the puppy's head. Even the way the puppy gets his name is done with humor and realism. (He looks like a doctor. Doc.) Elementary students can relate to the human attributes of canines when Diane Till writes, "Why walk when you can run? Walking on a leash is no fun." 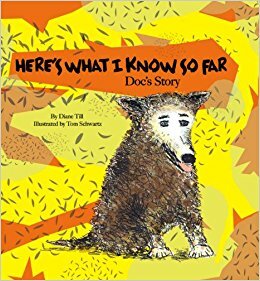 Teachers can use this descriptive picture book to talk about the various poetic techniques as well as the scientific information presented by Dr. Tim, who is a professional veterinarian. He explores the dog's action from a medical as well as evolutionary perspective so that the reader can share and understand. Every page is entitled "Here's What I Know So Far" and ends with "And That's What I Know So Far." This provides the reader as well as the teacher with an instructional assessment where every page is a life lesson. This is an excellent choice for fourth to six graders who need a book about how to take care of their pet, enhanced with poetry and scientific perspective. Written with humor and insight ("My family tree has a unique pedigree/ It produced this brilliant, one-of-a kind-me"), Here's What I Know So Far by Diane Till will keep kids imagining to the last page. Ari Handwerger is a school library media specialist at P.S. 114 in the Bronx, New York. 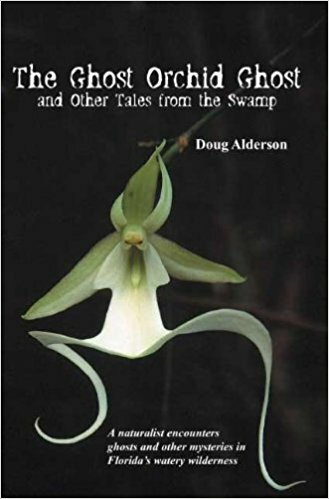 The nineteen tales in Doug Alderson’s The Ghost Orchid Ghost are designed for storytellers in search of campfire material, with an elementary-level educational emphasis on Floridian ecology. Each one takes place in an actual Floridian location, and after each story, the author dedicates a section to explaining the historical and ecological facts embedded in the tale. Alderson also includes an “Estimated Telling Time” (most are around ten minutes), helpful story-telling tips (“Pretend you are walking and abruptly turn around and scream, “Why are you following me?”), and black and white pictures. More effective are the stories that use child protagonists. Grounding himself in a younger point-of-view seems to keep Alderson’s focus locked into the forward-momentum of suspense. For instance, “Watson’s Place” begins, “Jacob could kick a soccer ball and play video games as well as most ten-year-olds, but he was peculiar in one way: he could see and hear ghosts.” As Jacob’s family heads into the swamp for a canoe trip, the audience knows exactly what’s coming and Alderson doesn’t disappoint. Other favorites are “Mosquito Crazy,” about a research biologist who turns, like Gregor Samsa, into a bug; “Nogoshomi,” about a girl who is pulled into another world by supernatural creatures; and “The Haunted Book,” in which a girl named Cheyenne investigates the death of a witch. Alderson’s book should be admired for its sheer usefulness, as it’s very easy to envision science teachers incorporating its stories into their units on the Everglades and guest speakers relating them when visiting classrooms. There can never be too many books that teach children about the importance of preserving Florida’s ecology. Mystery readers and nonfiction buffs, however, may want to look elsewhere. P. Scott Cunningham is a Florida Book Review Contributing Editor and a regular contributor to the New Times. His poetry has appeared or is forthcoming in Pool, Court Green, Cider Press Review and McSweeney’s Internet Tendencies. Before Hurricane Andrew, the hurricanes and tropical storms of my childhood were magical experiences. While my parents ran around making preparations, my sister and I would set up our own hurricane headquarters, a jury-rigged tent in the middle of our Florida room. Underneath old bed sheets draped over chairs, we’d imagine surviving a flood of Old Testament proportions. Eventually, the howling winds outside our shuttered windows would drive my terrified sister back into my parents’ bedroom where our dad would have to explain what was really going on. But for me, the sounds were a lullaby that always carried me into a long and restful sleep. 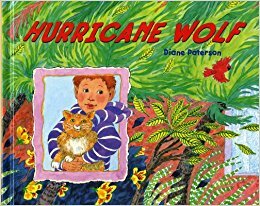 Diane Paterson’s lively Hurricane Wolf would have made both my sister and me happy. Hurricane Wolf follows Noah and his family as they brace themselves for the arrival of Hurricane Anna. As the boy helps his family put up shutters, buy canned goods, and fill bathtubs with water, his parents patiently explain the reasons behind all the preparations. The book’s appendix describes how hurricanes are formed, what their shape and structure are like. It even has a Saffir-Simpson Scale that whimsically replaces “categories” with cats. Two things keep the book from being too didactic. Paterson's dynamic watercolor illustrations dominate each page, rendering a lush Florida that is, yes, beautiful and idyllic, but also in a constant state of flux. And Hurricane Wolf’s adventurous and curious main character gives the book a necessary infusion of magic. Noah’s attitude towards the impending storm is one of naïve wonder. “My friend is lucky!” he says. “His family’s going to the hurricane shelter at school. They’ll get to camp in the cafeteria.” His parents rightfully explain the hardships that hurricanes can bring. As he waits for the storm underneath his own tent, as he watches trees fly through a peephole, Noah experiences both fear and fascination. This is the perfect book for kids who have never experienced a hurricane. The clearly laid out information will help to put some fears to rest. One visual scene sums up what I like best about Hurricane Wolf. After the storm, Noah and his parents walk out of their house and see a yard, and a neighborhood that is almost unrecognizable. Hurricane Anna is no Hurricane Katrina. The mess is mostly superficial: felled trees and fences. But the scene is as alien to Noah as a lunar landscape. It illustrates how even our mildest encounters with nature can transform the way we look at the world. Yaddyra Peralta is a second-year student in the M.F.A program at Florida International University. She is also the current art editor for Gulf Stream Magazine. 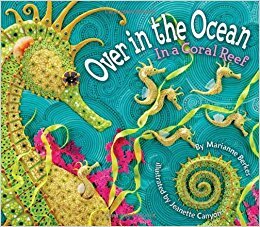 Over in the Ocean presents a fun rhyme about coral reef families, in the process teaching the numbers one through ten. The book centers around descriptions of families in the coral reef and their daily activities, from angelfish grazing to stingrays stirring the sand. Jeanette Canyon's illustrations, constructed entirely from clay, complement the story and give it a whimsical quality. Despite how fun it is to read aloud, Over in the Ocean is not for the ecological purist. In constructing families with ten or fewer children, it deviates from what could be called "traditional sea-life families," for example by depicting the octopus, which lays hundreds of thousands of eggs at once, as having only one child. It does contain some ecological insight, for example by (correctly) portraying the father seahorse as the primary guardian, but like many children's books that anthropomorphize animals, the book is not useful as a biological reference. The greatest resource I found in this book is in the back material. Berkes, a veteran Florida storyteller, gives a number of presentation suggestions, including using music and making sea-creature puppets. Canyon describes the process of molding the fantastical illustrations from clay, providing some tips of her own (you can give clay a sandy texture by adding black pepper!) And for those interested in further material, the book gives links to the publisher's website, which provides further classroom activities, and to the Florida Oceanographic Coastal Center. Despite some ecological inaccuracies, Over in the Ocean is a colorful and fun-filled journey through a coral reef that is very appropriate for those learning to count (ages 3 to 7). 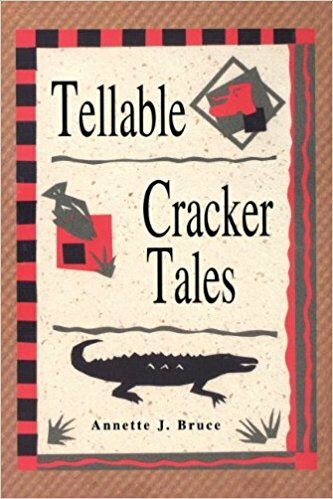 If you’re looking for some Florida stories for the kids, Annette J. Bruce has assembled Tellable Cracker Tales from oral tradition. The tales are all short, usually 2-3 pages, and range from the historical to the mythological. The “Cracker Jack Tales” share the same protagonist, Jack, “fourteen years old and wanted to be treated like a man, but was not to anxious to work like one.” In typical teenage manner, his mouth often runs off and lands him in big trouble. In “Bear Hunting—Cracker Style” Jack brags to a group of Yankee tourists about his bear hunting skills until they call his bluff and ask him and his father to take them for a hunt. Since Jack overstated his skills in this field, he instead leads the hunters into an area where smaller game is readily available and you can probably guess the surprise Jack encounters next. The “Cracker Jack Tales” are mini coming-of-age stories, where the protagonist often realizes that his parents are a little wiser than he first thought. If only this happened to nonfictional teens!
. . . go west of Gainesville to the Devil’s Millhopper. Due South of this sinkhole is a large, moss-draped oak tree. It is beneath this tree the sand-elves frolic, beginning at midnight, the first night of the full moon. They like to be entertained. If you dance for them, and they are pleased with your performance, they may grant you a cure. But remember, you must dance your best, as they do not like second-rate entertainment. This reminded me of an ancient Irish legend I once read, but the mention of the Devil’s Millhopper and the moss show how these old tales have been enriched with Florida flora and fauna. All the tales are rich with Florida flavor. At the end of each story, Bruce estimates how long it will take to tell. She suggests an audience which ranges from little children to adults, offers tips on how to portray some of the characters’ voices, and she often includes a comment or two about the tale. A few rough-looking illustrations lend an old-time feel. This is definitely a good book to use in Florida classrooms, at scout gatherings, or to read to your children at home.